Even though numerous research have proven that landing pages are an effective marketing tool increasing the conversion of leads into sales, still many companies, including large ones, refrain from investing time and resources into it. So, using landing pages may be a true competitive advantage which can help stand out among competitors and attract customers. At the same time, the creation of an effective landing page requires observation of certain rules and practices. Let’s dwell on some of them below. You can be really tempted to use the home page of your website as a landing because the necessary information is already there. You may erroneously think that just by adding a couple of tweaks to it you will get a perfect landing. No, you are wrong. The only thing you can achieve by doing this is to increase the number of visitors who close your website within a couple of seconds after opening it. The main reason is that the homepage of the website is a multipurpose source of information, while the landing page is a single purpose tool. It should contain limited information about the specific product or service and encourage visitors to perform one concrete action. As we already stated above, landing pages are used to encourage visitors to make one particular action and thus you have to help them do it by streamlining them through the information curve. Thus, the landing page should contain information on the promoted product/service/material, the description of the action you expect visitors to make, arguments which will convince them to do it, and the outcome they will achieve. At the same time, all these logical things shouldn’t be boring and should be presented in a way, which is appealing to your target audience. 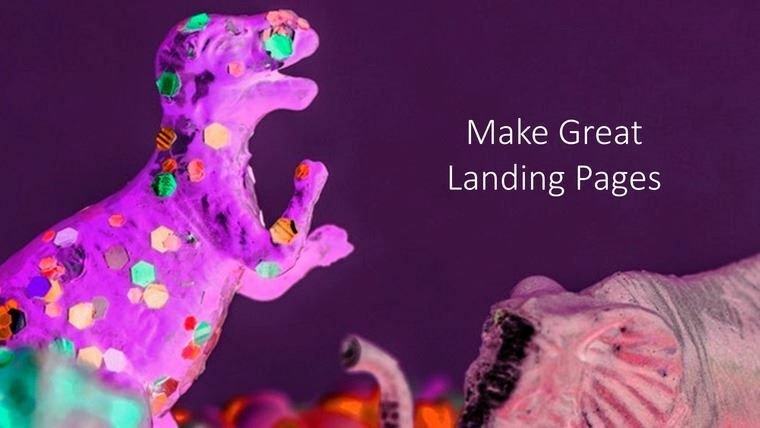 In order to increase the appeal of the aforementioned information curve enrich your landing page with high-quality visual content – videos, images, gifs, etc. It will help to retain the focus of visitors on the particular subject. The main sign of the high-quality visual content is the desire of users to share the landing page not because of the product/service/material it promotes, but for the sake of demonstrating a gif or a meme which they liked. Furthermore, visual content is consumed far more easily than texts and increases the chances of the landing page to become viral. As a rule, the main purpose of the landing page is to encourage visitors to make an order or share their contact details in exchange for something (promo code, publication, etc.). Thus, it’s very important to pay special attention to the design of call-to-action (CTA) buttons and data collecting forms. They are the final step which shouldn’t disappoint customers as they have already spent some time to navigate through your landing page. That’s why it’s crucial to remember that in the design of forms and CTAs everything matters – from their placement on the landing page to their size, color and font type. Some valuable advice on how to design appealing CTAs can be found in these blogs. A landing page is a kind of commitment, so don’t create one just for the sake of it. A landing page is worth investing time and resources only if you want visitors to perform a certain action or offer them something. Don’t create a landing page to share information, tell a story or establish communication. It’s primarily a sales tool, so use it accordingly. At the same time, always stay concise and stick to the point – all content of the landing page should be related to one particular subject or action. You can have the best copywriters and video production team in the world, but people trust other people more than random marketing materials no matter how creative they are. Use storytelling and share customers’ feedback on the landing page to encourage visitors to make the required action. The main requirement here is to be genuine which means to use real comments from ordinary people about your product and not paid reviews or feedbacks. As you might have already understood, the creation of the landing page is a complicated process so the risk of mistakes is high. That’s why before publishing your landing we recommend to test it. Neuromarketing tools are very helpful in this regard since they allow to collect and analyze information both the content of the page and its design at the same time. Eye-tracking, emotion measurement, and surveys demonstrate how customers interact both with the content and design of the landing pages, as well as whether they like it or not. Having this feedback in advance and adjusting your landing page accordingly, will help you deliver better value to customers and as a result increase the conversion of leads into sales. Landing pages are definitely worth trying if you are searching for unconventional ways to raise awareness about your products and services as well as increase sales. On the one side, it allows to put all your creativity into practice, and on the other to collect valuable contact information of customers which can be further used for different purposes.